Standing with legs slightly apart. 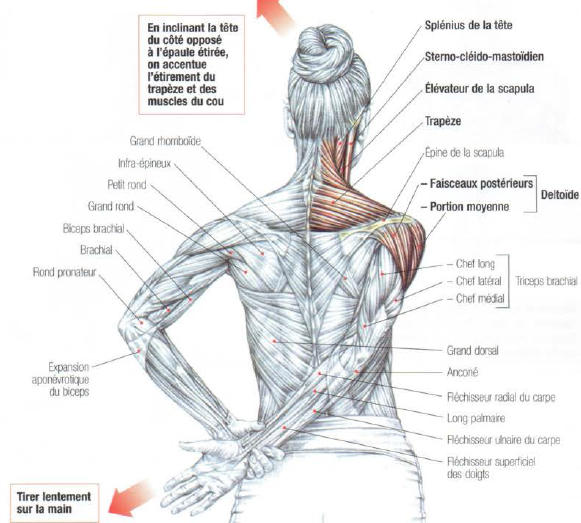 Your back straight with an arm your the back, Take your wrist with the other hand and pull slowly outwards and downwards to fell the stretch of the deltoid (rear and middle) and trapezius. To stretch the neck does the same movement by slowly tilting your head on the opposite side of the shoulder stretched. 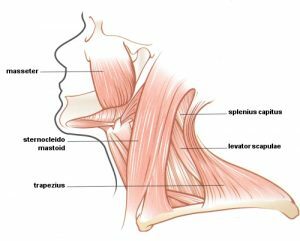 This variant allows you to stretch the deep and complex muscles around cervical vertebrae and scalene muscles and sternocleidomastoid muscle. Inhale and exhale slowly focusing on the relaxation of your body. This allows you to relax your back and rebalance the pressure inside the intervertebral discs (the discs that connect the vertebrae to each other). 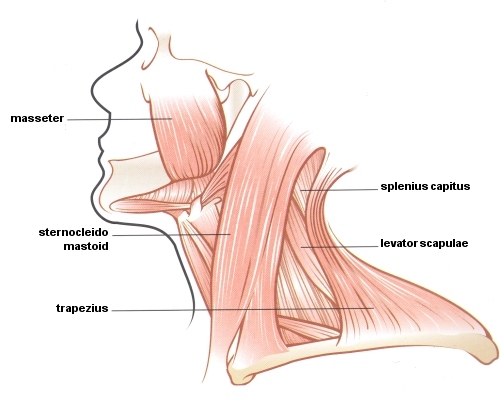 When you feel your muscles relaxed, lower you head forward to try to touch your sternum with your chin. This allows you to stretch the middle and the top of your back. To increase the stretch, you can ask a person to grab your hips and pull you slowly down or you can swing slightly. This stretching is essential. When you do it regularly at the end of deadlift, squat or other exercise that compresses the spine, this allows you in the long term to limit the deterioration of your intervertebral discs. 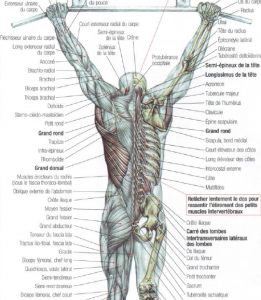 This means that this stretch reduces the risk of spinal disc herniation. With a tight grip, you stretch more the latissimus dorsi and teres major. When you do this stretch, it’s possible that you hear cracking of the spinal column followed by a pleasant sensation of release and relaxation of the back. Don’t worry, these crackles have no gravity. It’s because of the relaxation of the paravertebrale muscle that allow the brutal decompression of the small intervertebral and costovertebral joints. This make the same effect as a suction cup that you take off. The most common painful affection of lumbar region is low back pain. Usually it’s not serious because it’s often due to the cramps to the small paraspinal deep muscles of the back that connect mainly the bony processes of the vertebrae between them. This happens during an uncontrolled extension or rotation of the spine. 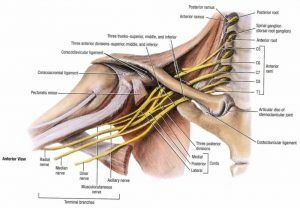 When one of these small muscles has an excessive tear or stretch, it contracts right away. 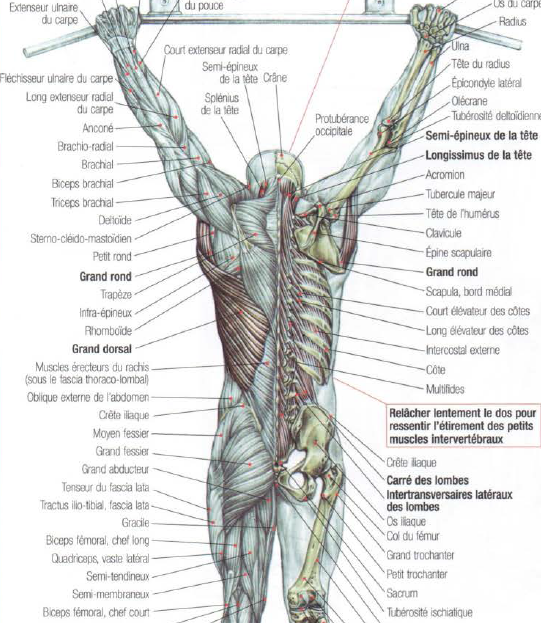 The results is that all small neighboring muscles and erector muscles contracting. 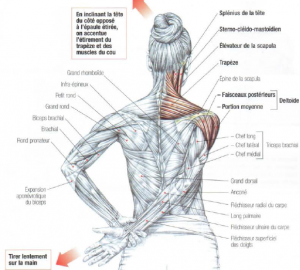 The back blocks itself and there is a pain but this blocking of the back allows to limit the movements that can aggravate the tear of the small paravertebral deep muscle. 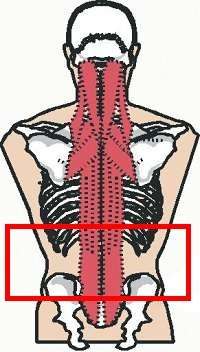 This general contraction of the lower back lasts a certain time and disappears most often with the healing of the small paravertebral muscle’s tear. But it’s possible that some people after healing have these contractures localized for several weeks or years. These back muscles contractures which are generally not severe may accompany more severe vertebral pathologies such as fractures, ligament tears, muscle tear or herniated disc. In bodybuilding, having a bad neck’s position during an exercise can create neuralgia. These neuralgias are numbness of the arm with tingling. These sensations arrive a few days after doing exercise like dips, pec deck rear deltoid lateral, squat and deadlift. The cause is that the exercises were done with the neck extension, head back. 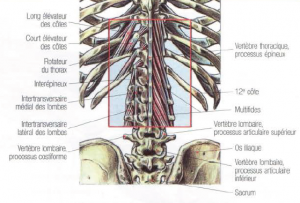 The truth is that the head back’s position triggers spasms and contractions of the deep muscles of the neck, which creates compression of the spinal nerves at their exit from the cervical vertebrae. This compression creates a neuralgia that usually affects the brachia plexus around the vertebrae C4, C5, C6, C7, C8 et T1 (C for cervical and T for thoracic). 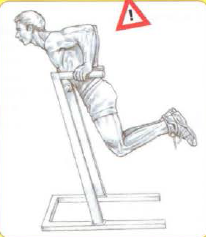 Do dips or pec deck rear deltoid lateal with head forward by bringing your chin to your chest. This avoids these neuralgias. Do deadlift or squat with your head straight (neutral position) looking forward. This avoids these neuralgias. If the neuralgia installed, it’s important to stop any exercise with the head back (neck extension).